First there was six-month-old Jonylah Watkins, gunned down alongside her father in Chicago last year. Now, the family of Ne’Riah Miller, a toddler killed in a shooting in her Kentucky home this summer, have to mourn another gone-way-to-soon life stripped of potential. 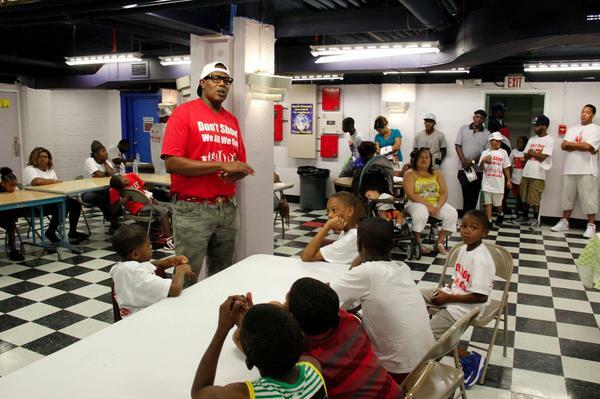 Percy Miller aka Master P talking to kids about his Let Kids Grow Foundation. To combat this sorrowful reality, community members of Shawnee, KY pulled together and marched in support of lil Ne’Riah. Among them was rap mogul Master P, who hails from Louisville, and used the occasion to teach kids (including his two sons that marched alongside him) what they need to do to have bright futures. After the rally, organizers, Ne’Riah’s family and fellow marchers gathered at a local YMCA to hear Master P and Christopher 2X, a Louisville-based community activist, speak to youngsters about tapping into their potential. Decked out in a fire engine red tee with “Don’t Shoot…Let the Kids Grow” text in the front, Master P reminisced about his only goal growing up in the Louisville PJs was to live to be 19. And didn’t have a clue what to do after that milestone. Well, he certainly developed a blueprint that included basketball and music production. Now through his Let the Kids Grow Foundation, he’s steering the young ones to alternate life paths BESIDES slinging crack-rock or having a wicked jumpshot. Kudos to P for giving back to his hometown ‘hood and trying to help turn this vicious tide.